What's the opposite of a frenzy? Whatever it is, that's what food has become for me. I am writing and editing like a woman possessed and eating like a woman who's forgotten how to cook. Wraps. Vegetables thrown in the Actifry for 20 minutes. Clementines. Crisps and cheese. That's the bulk of my diet right now. I just need to get 8,000 to 10,000 words of Real Port Talbot done over the next 4 or 5 days and then I'll be able to relax over the Christmas week. And speak to people. And eat. And breathe. In an attempt to make myself appear as if I am still interested in food I've changed the banner picture on my hungry writer Facebook page to last year's Christmas table. Before the scrum. 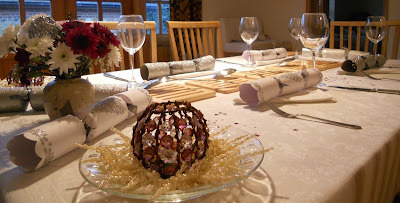 I went for silvery and understated. This year I'm going for jolly red and green and gold. 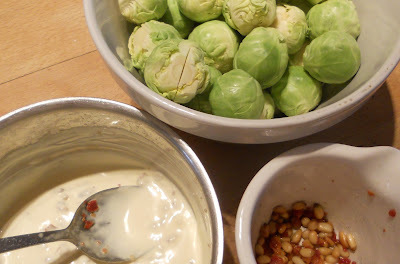 And here's a pic of the sprouts with bacon and pine nut sauce I'll make. And here's a glass of champagne. Yay! Yes, please! I'll be back here before the festivities begin though. If only to shout that I reached my word goal. Write about laying a table. Write about the first sip of a drink you love. I remember them with fondness!